> Research Library > Oracle > Evolving Customer Relationship Management: What's the Next Best Action? 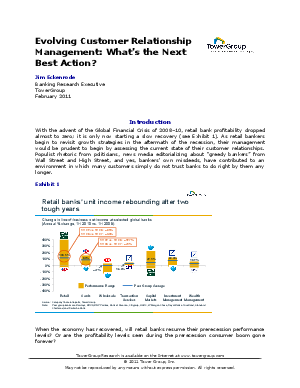 With the advent of the Global Financial Crisis of 2008-10, retail bank profitability dropped almost to zero; it is only now starting a slow recovery. As retail bankers begin to revisit growth strategies in the aftermath of the recession, their management would be prudent to begin by assessing the current state of their customer relationships. Populist rhetoric from politicians, news media editorializing about "greedy bankers" from Wall Street and High Street, and yes, bankers' own misdeeds, have contributed to an environment in which many customers simply do not trust banks to do right by them any longer.